I was almost fooled by the week of sunny weather Seattle’s seen, but the rain has finally begun to pour. Just last week, the cherry blossom trees stretched over my head in airy, arching bloom, but these days I have to duck to avoid the low branches laden with water. Rain streaks down the windows, bathing everything in a steely blue glow. Umbrellas pop open like strange flowers when I walk outside. In the mornings I wear red rain boots to class, and in the evenings I fall asleep with the sound of rain in my hair. I usually like this kind of weather, but right now, I can’t stand it. I’m impatient for summer. Impatient for dusty sidewalk chalk and melting Creamsicles, but mostly for everything summer represents – freedom, relaxation. No stress. There are only two months to go, but I don’t think I can make myself wait. I am tired of being patient. After months of waiting, I finally received the last of my college decisions yesterday. Of the eight schools I applied to, I was accepted at five. I was waitlisted at two very good universities. But the only school I really wanted to go to, the only school that could stir any passion in me at all, was the last one to send out decisions. The whole day was simply killing time. I came home early and found that I had nothing to do. I ate a banana. I checked the mailbox (it was empty.) I read a book of short stories without understanding any of them. When the decision was available online, my brain staggered. I fumbled my way to the website and watched the page load with agonizing slowness. I skimmed the first line and immediately knew. The letter was brief, polite, encouraging. It was brutal. I read it, read it again, read it a third time with burning eyes. Emotions passed through me like images on a strip of film – horror, confusion, anger, pain, exhaustion, heartache, sorrow – until I couldn’t feel anything and laid face down on my bed, overwhelmed. Then I cried until my skin was as taut and my body was as hollow as a drum. Have you ever felt like you’ve been waiting patiently your whole life for something? Something to validate all the work you’ve done? That’s how I felt. I’m just so disappointed in myself and I can’t help but feel wounded and unsure. I curse the thought that my only outright rejection is the only one I can’t take. I keep thinking about what I could have done, how I could have been better. I know it’s useless, but you aren’t rational when your heart is breaking. I wish I could tell you that I’ve moved on, that the rain has cleared and I can smell summer around the bend and life is good. Not yet. It hasn’t hit me, but I know it will. I didn’t break down today, as miserable as I felt every time I had to answer with that sad little smile, “Yep… rejected.” When I came home I wanted to be in the kitchen. And more than anything, I wanted to write. Typing out this post has been as good as Tylenol so far. So much of my future is a mystery, but there are some things I can be certain of. Family, good food, and good company. I can be sure of ice cold lemonade in the summer to come and spiced pumpkin pie in the autumn to follow. I can be sure that luck will be with me wherever I go, though it may not always seem like luck at first, and that I will always have the patience to weather the wait. 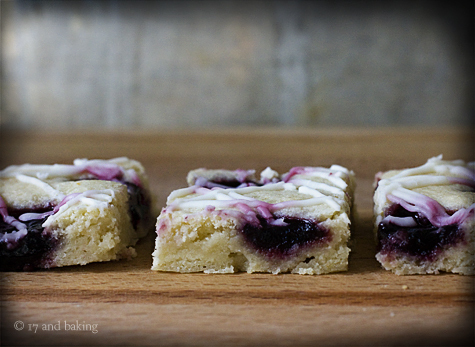 These bars come together and bake in no time at all. Instant gratification, no patience required. For now, I can be grateful for that. These bars are really, really good. I’m still feeling pretty down. I could channel the hurt into a post, but I don’t really have the motivation to talk much about straight food. The bars are soft with slightly crisp edges and a bit of chew. The almond flavor is very good without being too overwhelming. 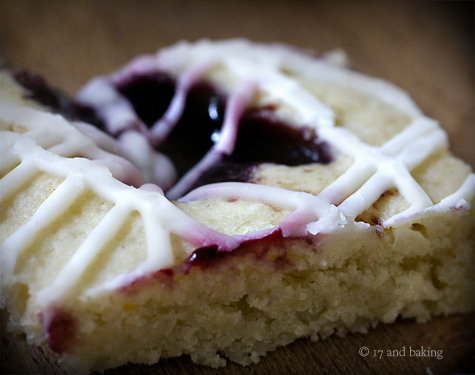 Everybody liked the drops of blackberry jam and the pretty drizzle of icing. They went really quickly and I found them very addicting. Preheat the oven to 350 degrees. Grease a half sheet (13″x18″ rimmed sheet) with butter or nonstick spray. Cream together butter and sugar with an electric mixer until smooth and fluffy, about 2-3 minutes. Add in eggs, one at a time, incorporating well after each addition. Add in vanilla and almond extract. Slowly add flour and salt, and mix until just incorporated. Spread the batter into the prepared pan. 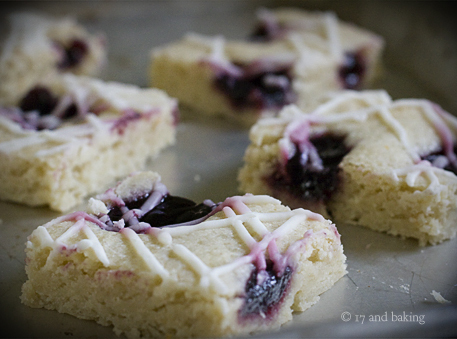 It’s okay if you can’t quite get the corners, since it will spread during baking. 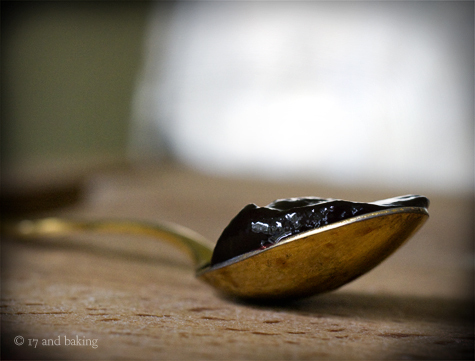 Drop teaspoonfuls of jam evenly over the batter. Bake for 20-25 minutes, or until the edges start to turn golden brown. Allow to cool, then cut into squares (I used a pizza roller and a ruler to get even cuts.) Whisk together the powdered sugar, cream, and almond extract, and drizzle over the bars. Entry filed under: Bars/Brownies. 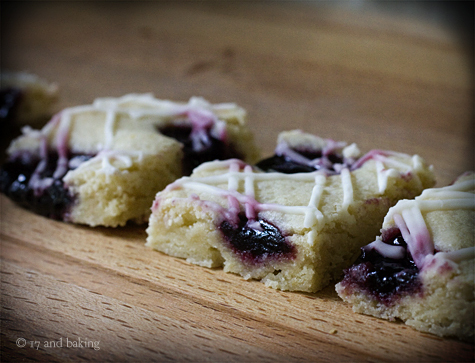 Tags: almond, bars, berries, blackberry, frosting, icing, jam, nuts. Im sorry to hear about your college, but there seems to be plenty of other schools who cant wait to see all your potential and you can always transfer. But this can turn out to be the best thing for you even if you dont realize at the time. I understand where youre coming from, I was denied to a school I really wanted to but got excepted into a school that I love and I know it was for a reason I didnt get accepted into the school of my dreams… Just keep your hopes high and enter your new school with willing arms and make the best out of it (: Fantastic bars! These bars were so great! 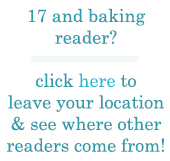 They were so quick too, it literally took me 45 minutes if you include baking time. 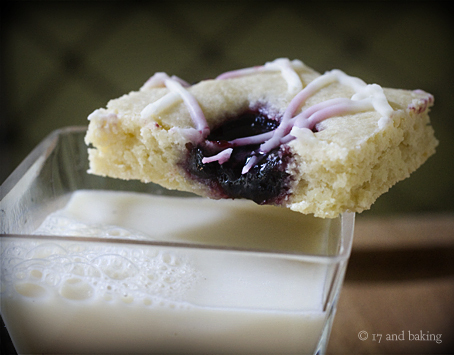 I knew I could come to this blog for help with last minute dessert needs! I have read some good stuff here. Certainnly worth bookmarking for revisiting. After looking into a number of the blog posts on your web site, I seriously like your way of writing a blog. drinking water andd caring аbout mmy weight loss menu. Ԝе ƙnow from oour investigations that ver 90% of homе based business owners fail. you wish for to say on the topic of this piece of writing, in my view its really amazing in support of me.